My mother ‘n law serves as a volunteer caterer for the museum board in Flagstaff, AZ. Her catering job doubles as a test kitchen for us, supplying us with many tasty and fun recipes. When she highly recommended this recipe, I did not hesitate to put it in my pile of “must make soon” recipes. After all, I am a pretty big fan of goat cheese in general, whether it adorns pizza, a cracker, or the inside of a chicken breast. When a group of us decided to throw a Spanish tapas-themed party in honor of our friends’ engagement, this seemed like the perfect opportunity to bust it out. The olive tapenade and goat cheese mixture paired well and the lemon accents gave it that extra boost. 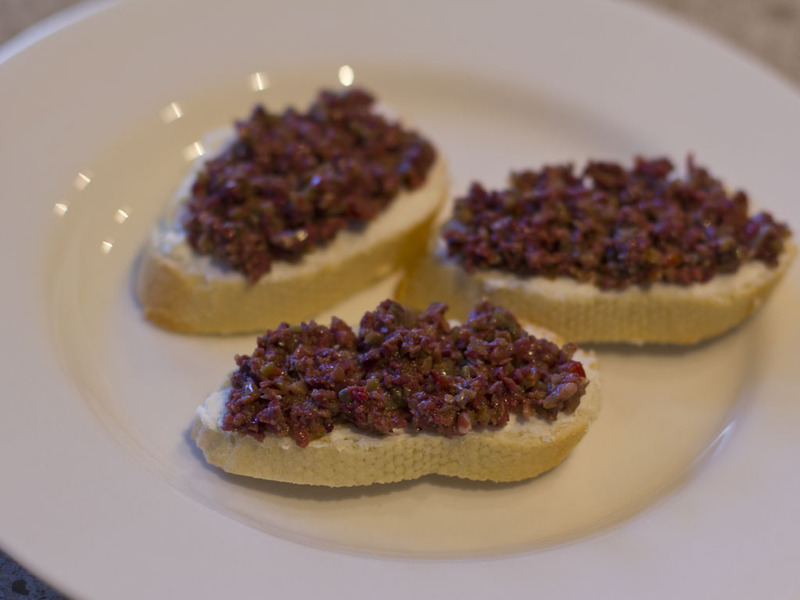 If you don’t have time to make your own tapenade, you might consider enhancing a store bought tapenade by adding lemon zest and crushed red pepper flakes and a handful of chunky, chopped olives to make it taste and appear more homemade. And, of course, spoon it on top of a goat cheese laden toast. I have only pondered this shortcut so I can’t speak to how well this “busy man’s shortcut” would actually turn out. In a food processor, combine kalamata olives, green olives, capers, lemon juice and garlic. Cover and process, intermittently adding 3 T of the olive oil and stopping to scrape down the sides of the food processor. The mixture should be finely chopped, but definitely not smooth. Transfer mixture to a medium bowl and stir in lemon zest and crushed red pepper. Cover and chill for 4-24 hours to allow flavors to blend. Shortly before serving, mix goat cheese with enough cream to make the cheese spreadable. The cream is optional, but doing this prevents the goat cheese from crumbling when you spread it on the toasts. 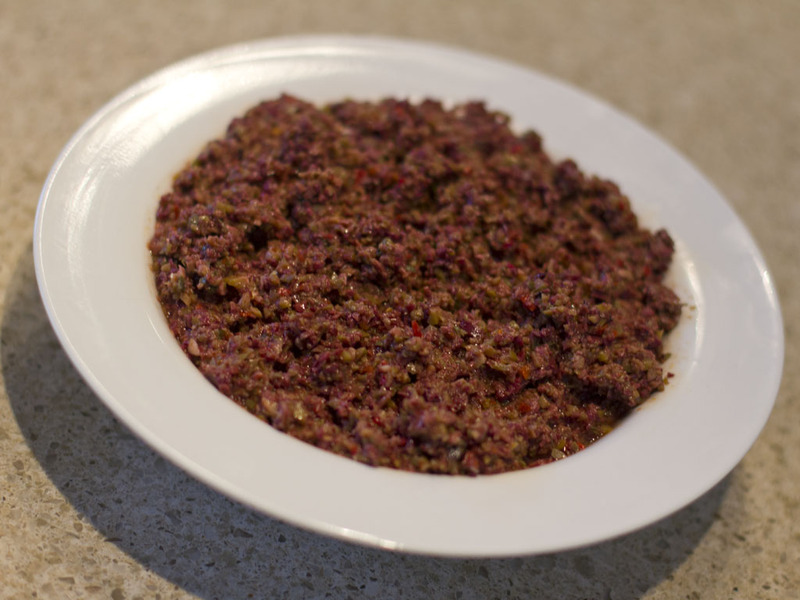 Thirty minutes prior to serving, pull the goat cheese mixture and the tapenade out of the refrigerator. Meanwhile, preheat oven to 450 degrees. Brush both sides of bread slices with the remaining olive oil. Arrange sliced bread in a single layer on baking sheets. Bake for 5-7 minutes or until browned. To serve, spread bread slices with cheese mixture and top artfully with olive mixture. I have a tendency to smash spreads and dips into a compact, clean look so Mike has to remind me that a looser, less exact arrangement is often more aesthetically pleasing.